What does that mean? Allow the story of my little rescue couch to explain. When I was working and living in New Orleans after Hurricane Katrina, I had the privilege and pleasure of getting to know the city’s historic neighborhoods through direct interaction with the residents and their homes. I spent a lot of time driving around, getting to know each district’s architectural style and the accompanying vibe of the neighborhood. Always avoiding the interstate, I learned the shortcuts through forgotten parts of the city, past abandoned churches and storm battered shotguns. I witnessed firsthand the power of resilient people, intent on rebuilding their homes and their city better than before, but with respect for its past, especially its architectural and cultural heritage. One particular day, I was riding with my co-workers through the narrow, uneven streets of Mid-City when, all of a sudden, a simultaneous and collective gasp echoed throughout the vehicle. There on the curb, in front of an Italianate double shotgun, sat the most fantastic couch ever to be discarded on the side of the road. I’m pretty sure the perfect patina of the wood frame was not the first thing that caught our eyes. More likely, it was the hideous, burnt orange upholstery and the wayward springs protruding from under the seat where the cushion once sat. We stopped the van and hopped out, inspecting the couch as if it were an injured animal. Yes, we all agreed, it was sturdy and in good condition – nothing a little re-upholstering couldn’t fix. We were all giddy with excitement, amazed that the couch had been thrown to the curb, and astounded that no one had yet hauled this beauty home. I managed to lay claim to the couch and left a very urgent message on my husband’s voicemail, sweetly suggesting he pick up the couch on his way home from work. Props to my saint of a husband for trusting me on this. That evening, I arrived home to the most beautiful tattered orange couch I’d ever seen. It had potential. I was certain of it. It wasn’t until two years later, after moving cities and houses, that I was able to give the couch a facelift. When we moved in, we placed it in the dead center of the living room, its burnt orange glory displayed for all to see. It sounds odd, but we were really proud of it. The couch quickly became a conversation piece with guests – a sort of souvenir from New Orleans. Most people laughed with disbelief at the fact that we’d actually picked it up off the side of the road. Skeptical friends were assured that one day, we would provide them with a comfortable place to sit. After months of hunting for the perfect (and perfectly affordable) linen fabric, I sent my orange couch off for its big makeover. I made sure to photograph it first, so that I’d always remember the thrill of finding it, tattered orange fabric and all. 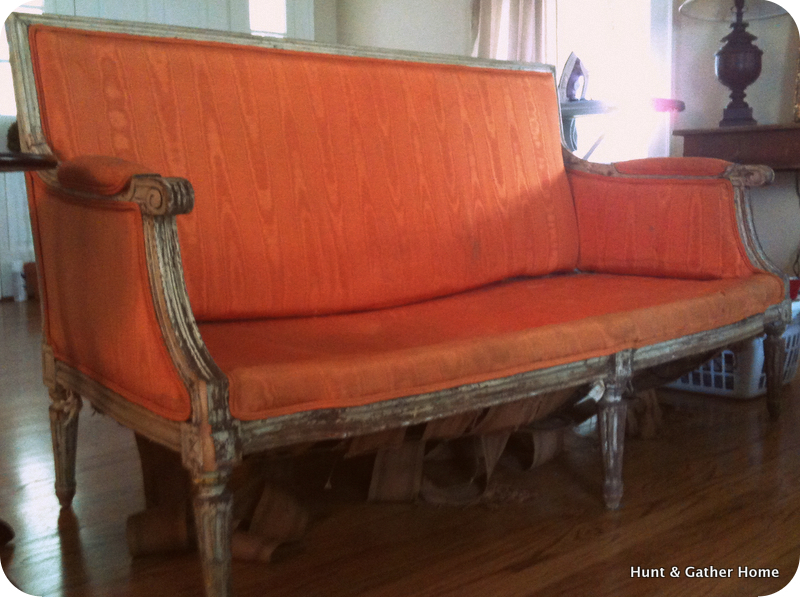 To my delight, my little orange couch returned to me looking just as I had pictured it in my head. The cushion was thick and comfy. The fabric was nice and soft and just the right neutral shade to enhance the grey tones of the worn wood frame. It now provides rest and comfort for our family and friends, a place to snuggle, and a place to be silly. I will always call it my “orange couch.” It reminds me to look for the good in everything and everyone I meet. It reminds me to be myself, to take my time, and to be creative. It inspires me to decorate my home with things I love, things that have a history to share and a future to offer. Its story represents the heart of Hunt & Gather Home. 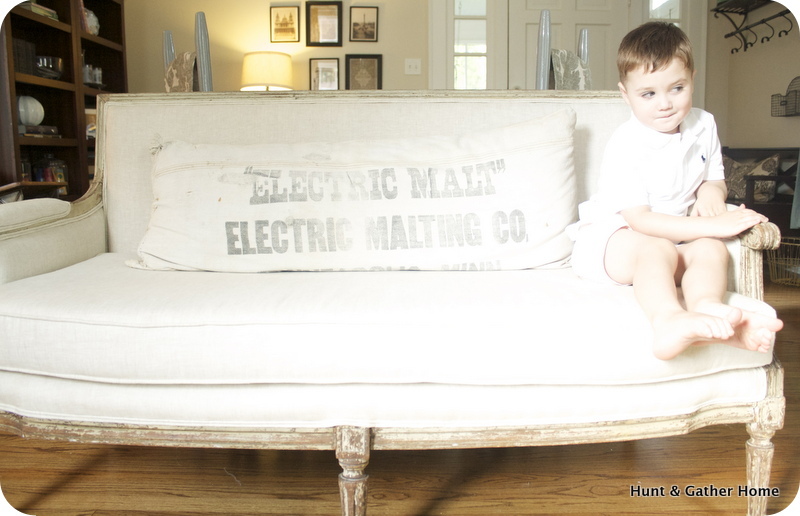 Love this story, especially the way you describe the meaning behind the couch! What a great vision you have. It looks fantasic! I’ve been wanting to start a website/ blog too…release date TBD. Thanks, Julie! Hope to read your blog sometime soon:) Keep us updated! Awww, the orange couch! I have very fond memories of nights spent talking or laughing about random things on that couch after it’s transformation. And of its orange cushion-less days watching Adam balance his weight on the middle support so we could sit on the other couch. Good memories, good memories. Sarah, your comment made me smile…good memories indeed. Hope we add to that list this coming holiday season. We miss ya’ll!